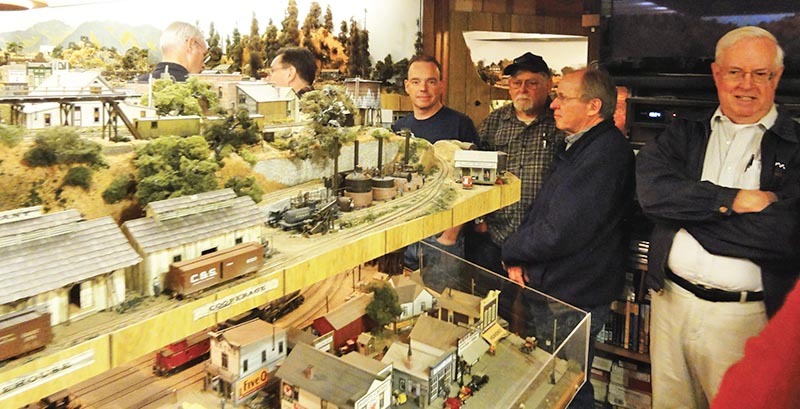 From right to left: Gary Schrader, Mike Musal, Dave Grandt, Steve Anderson, and two others enjoy Jim Vail’s layout. As I noted in the March/April “Robert’s Ramblings,” Jim Vail passed away January 28, 2018. He told his daughter, Kate, that he did not want a memorial service – but did want his operating crew and friends to gather and run his layout one last time. 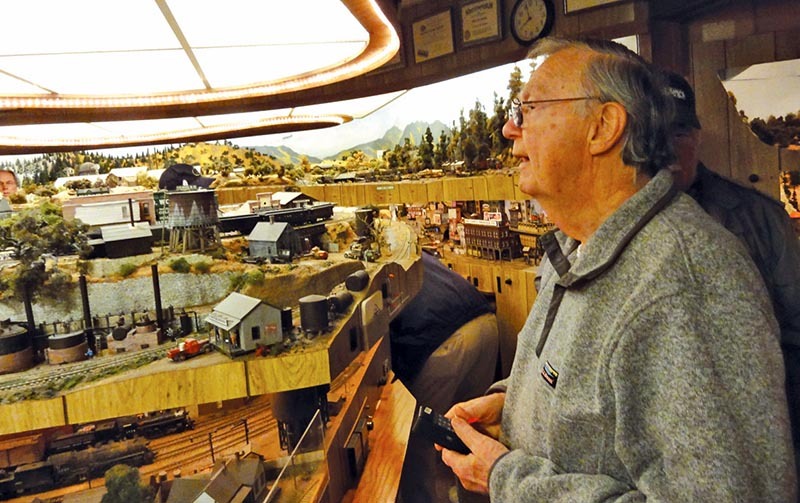 Truly a “Last Run.” So, Kate, Dave Adams, and Mike Schwab cleaned the track, “tidied up Jim’s layout,” and on February 24, an operating crew – including Charlie Getz and me, plus others of Jim’s friends gathered to run trains. Dave said that because the layout had “… not turned a wheel for so long…” we would have to run by “smoke signals.” So, we did. No timetables, car cards, or dispatchers – just running trains. In between running trains, we drank coffee, ate donuts, discussed funding a memorial bench in Jim’s memory at the nearby Roaring Camp & Big Trees Railroad, and reminisced about Jim. Here, I am, running the Rico Local. Charlie Getz took the photo. I’m not sure if having ones mouth open helps run trains. I am not known as an operator, but someone thrust a controller for No. 345 in my hand, and told me to run a train. So, I put my donut down, and had fun running the Rico Local around the layout. I want to thank Kate, Dave, and Mike for organizing this farewell to Jim. I know he would have enjoyed it.